John Creger -Author of the Personal Creed Project. This interview is part of a series of JMC interviews that follow up with winners of the James Moffett Memorial Award for Teacher Research given annually by NCTE’s CEE and the NWP. In 2001, when John Creger won that year’s Moffett Award, then CEE Chair Janet Swenson wrote that “the panel deemed Creger’s proposal ‘the most representative of the thoughts and ideas that continue to make the works of James Moffett an invaluable resource for teachers of the English language arts’” (Awards). The award was given in recognition of the Personal Creed Project, a classroom-based rite of passage Creger created and has been refining with his high school sophomores for 20 years. This interview was originally created specifically for and by the JMC Ning http://jamesmoffettstudies.ning.com/. It is part of what will be a series of interviews that follow up with winners of the James Moffett Memorial Award for Teacher Research that is given annually by NCTE’s Conference on English Education (CEE) and the National Writing Project. This award has been offered since 2000. It gives grant support for “teacher research projects inspired by the scholarship of James Moffett” (see http://www.ncte.org/cee/awards/moffett). In 2001, when John Creger won that year’s Moffett Award, then CEE Chair Janet Swenson wrote that “the panel deemed Creger’s proposal ‘the most representative of the thoughts and ideas that continue to make the works of James Moffett an invaluable resource for teachers of the English language arts’” (Awards). The award was given in recognition of the Personal Creed Project, a classroom-based rite of passage Creger created and has been refining with his high school sophomores for 20 years. 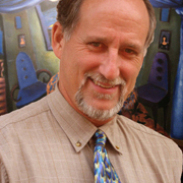 Since receiving the Moffett Award, Creger has described the Creed Project and the approach to learning that is evolving from the project in California English (February 2002) and has published a guidebook for teachers, The Personal Creed Project and a New Vision of Learning, which has won him praise. He has also created two online spaces dedicated to teacher exchange, the first a site to support his book: http://www.universeWired.com. More recently he hosts a Ning discussion group athttp://englishcompanion.ning.com/group/pers “dedicated to deepening students’ engagement in learning.” He has seen his Personal Creed Project taken up at other schools and colleges by teachers across the country, and is now helping teachers in Canada, the UK, and Ukraine who are likewise adopting and adapting the project. be making her life count for others at the end of that period. This interview will be posted in three short serial installments over the course of the next week. This first serves mainly as an introduction. Please read, enjoy and offer your reactions, opinions, views and feedback. Koshnick: Thank you for your time here and for your excellent work. First, what did winning the James Moffett Memorial Award in 2001 mean to you? Creger: It’s my pleasure to talk with you, Damian. I’m glad you’re hosting this site, and appreciate all this effort to preserve and carry on Moffett’s work. Well, the Moffett Award was a huge surprise for me. For several years after the award came, the thought knocked the wind out of me every time it occurred to me. I’d never known Moffett personally, as had several of the people I’d been meeting over the past few summers when I attended conferences put on by NCTE’s Assembly for Expanded Perspectives on Learning, of which Moffett was the first member. I wasn’t deeply familiar with his early work, and had only recently read his final book, The Universal Schoolhouse: Spiritual Awakening Through Education. In Schoolhouse, Moffett lays out the most inspiring and comprehensive vision of education I have come across to this day. As the subtitle announces, The Universal Schoolhouse boldly links the spiritual with learning. It was a special mixture of boldness and brilliance, along with a certain mysterious familiarity I felt when reading his work, that drew me to Moffett, and still does. It’s sad to think about. But this set of abuses continues on an even larger scale across our culture today. What I would have needed to prevent my disaffection, I now realize, is for school to help me connect what I was learning with who I was becoming. For this kind of learning I would have to reach beyond formal education. Only after high school was I able to begin in this. Working close to nature in rural New England as a carpenter during that following decade, I was forced to learn respect for the elements and forced to wrestle with my own limitations—physical, emotional, intellectual for and spiritual. In the wrestling I gained the beginnings of self-knowledge, and a nascent sense that a purpose in life would find me if I kept on its trail. Disabled with a back problem that ended the independence I treasured as a tradesman, I decided to give classroom learning another chance in community college. This sense of discovering a purpose in life made an enormous difference in my attitude toward learning. My arms unfolded as I threw myself into reading and, most of all, writing. After a year at community college I found myself at the university. At Berkeley I was hungry to learn more deeply about why I was in the world. Discovering myself as a writer was part of this learning. Writing papers became part of my journey of self-discovery. I pulled weekly all-nighters happily. Shortly after I graduated, my writing had been published in five languages on three continents. More significantly, I was coming closer to discovering a direction in life guided by a deepening sense that I was here for a reason—and my education, strange to say, was heading me toward finding it. I had broken largely free of that abused feeling of being herded by other people’s agendas. My own purposes were fueling my learning. Koshnick: When did you first come across Moffett, as an undergraduate, or …? Creger: I had started my teaching career with only a surface exposure to Moffett’s ideas on literacy instruction as he formulated them in Universe of Discourse. But in my credential program I saw that his influence was everywhere. Perhaps it’s fair to say—certainly for literacy educators who began in the early 90s or before— that our period is the Age of Moffett. Many of us who started our classroom careers in those days, along with those in touch with the deeper currents in our field today, continue to be guided by Moffett’s belief that students’ own lives –and not an artificially imposed curriculum– should be at the center of their learning. This belief was certainly the guiding intuition of my early teaching. After eight years in the classroom, in 1995 I took a leave of absence to attend graduate school. And while I hadn’t immersed myself consciously in Moffett’s work at the beginning of my career, when I first read Universal Schoolhouse during my leave I saw and felt a commonality between Moffett’s ideas and the ones I’d begun developing. I had started the Personal Creed project my second year of teaching, years before I took a leave, but in graduate school I found myself reflecting on my students’ enthusiasm for the Creed experience, trying to understand the marked changes I had seen come over entire classes during the week of Creed presentations. The project has been the first thing students seem to remember about their year in my class. Moffett’s book helped me see the work I had begun in the context of a much larger vision. What has the Moffett Award meant to me? Before the Moffett Award there was no one I could talk to about all this. My colleagues were buried in their own work, especially at the end of the year when we culminated the Creed Project at that point, and I most needed to talk about what I was seeing. My wife was busy with our young daughters. Despite the increasingly deep and evolving caliber of my Creed presentations year after year, I had a strange sense of being an imposter. Who was I to think that what was happening in my classroom could help develop an approach to learning that could be of real value to others? The award gave me a vote of confidence. Moffett’s writing, Schoolhouse and others I’ve read since, gave me permission to trust the intuitions I was having and the thinking that followed. The award gave me permission to share my work more confidently with colleagues. On a practical level, the award also gave my work recognition that led to a contract with Heinemann for my first book. The book, along with the opportunity to offer workshops for colleagues, allowed me to share the Creed Project with colleagues with whom I can now share experiences and perspectives. But emotionally, the whole idea of an award coming to me in Moffett’s name gave me chills for years. What kept me going through the doubts I mentioned above was my students’ enthusiasm. That enthusiasm, and the uncanny transformation of one of my all-time most unruly fourth period classes after their Creed Project presentations, convinced me I needed to start keeping a journal and documenting what was going on in the classroom. So by the time the letter came informing me that I was receiving the Moffett Award—a letter dated September 11, 2001—I was already planning to write seriously about the Creed Project. Just as I had found my attitude and motivation to learn rejuvenated by the self-knowledge I had gained in my life experiences and increasing sense of purpose after high school, I was witnessing a similar effect of age-appropriate self-discovery on the 15 and 16 year-olds in my classroom. They too, in their own ways, were writing about breaking free of that abused feeling. Koshnick: In my experience, many people have a hard time interpreting Moffett’s later work, but I see in your Personal Creed Project a concrete and innovative realization of some of his most critical, later publications. Creger: I think you’re right that my work has been more influenced by Moffett’s later work, particularly by Universal Schoolhouse, in which he stepped out of the closet about the spiritual underpinnings of his thinking. One of the ideas that has influenced my thinking and teaching quite directly is his notion of the shifting foundation stones of education. Moffett sees the old “Flag and Dollar” foundations of nationalism and economics being slowly replaced during our times by two new foundation stones–culture and consciousness. For reasons I explain in my book and will probably bring up here later, I loosely translated these last two somewhat general and abstract terms into the academic and personal legs of curriculum as I now conceive them. I rely extensively in this portion of my book on ideas and quotations from Schoolhouse. Koshnick: The foundational shifts that you mention from Moffett–from nationalism and economics to culture and consciousness–and your own translation of the second pair of terms, the shift, again, from nationalism and economics to academic and personal, all seem very relevant to this distinction between reform and renovation. Where do you think we are in our movement toward these grand shifts in action and consciousness? Creger: Great question. I think we’re too close to the action to have a terribly accurate understanding of where we are in the shift Moffett describes. In general, my sense is that the late 80s and early 90s was a time of openness to new approaches and attitudes in education. This was a time of active evolution in culture and consciousness. Through the early 90s, the openness to a positive future accompanied by the sudden dissipation of the Cold War was also felt in education–the establishment by progressive educators of best practices and professional standards was an expression of this openness and confidence in the future. We can think of these trends as part of an evolution of culture as it was then expressed in education. But as the 90s went on, these initiatives from educators were co-opted by business and government, and by the late 90s, after Moffett’s death, the old Flag and Dollar forces of nationalism and economics had reasserted their dominance over education. The late 80s and early 90s were also friendly to the development of consciousness. My first department chair and early mentors encouraged me to experiment in the classroom, which I found was a natural proclivity for me. The Personal Creed Project was born in this period–a classroom-based exploration and celebration of consciousness. During the 90s the Creed Project gestated quietly, flying under the radar as it slowly developed in my classroom, and by early in the 2000s had been recognized by NCTE and written about in California English. Fortunately, business and government have been little aware of its gradual spread in schools and colleges around the country, and the project, along with the principles and practices it has brought into the open, offers increasing numbers of students and teachers a tested, powerful way to nourish and evolve our consciousness, despite the continuing regressive influence of the high stakes period (even, it appears at this point, under the Obama administration). The shift Moffett speaks of is an evolutionary transition that will probably require generations to show decisive fruition, and we can expect considerable backwards as well as forward movement. When I wrote about this transition in my book, I brought in perspectives from other sources–cultural historian Riane Eisler’s notion of the long shift from dominator to partnership societies, the Urantia Book’s vision of an inexorable transformation in human motivation from the profit motive to the service motive–to put Moffett’s discussion of the evolutionary shift in education in context. The flowering of culture and consciousness or, as Moffett describes it, the replacing of education’s foundation stones, is less about incremental reforming of existing paradigms, principles and practices, I think, and more about making fundamental shifts in our understanding of the nature and purposes of learning–and then renovating existing paradigms, principles and practices in accordance with our new understanding. I see the Personal Creed Project and its “offspring”–the Model of Workable 21st Century Learning, the Cross-Section of 21st Century English Curriculum, the Two-Legged approach to weaving deeper learning into our courses and programs as they exist today–as part of the theory and practice of renovation. While this is a fascinating shift to contemplate, the fact is that most educators have little wherewithal to consider what we do every day in such evolutionary terms. When I began developing these approaches what I wanted was a way to move with my students in the direction of Moffett’s vision of education. Once I felt we were making some progress in this, I wanted to be able to share it as painlessly as possible with busy colleagues. What I realized is that we were very far from ready, in education, to talk in terms of the evolution of culture, let alone consciousness. For one thing, we really have no consensus in our larger culture that the personal development of our students is a goal worthy of building toward. Certain classrooms and schools may emphasize students’ unfolding in different ways, but we have no real vision of this aspect of education in our ongoing conversation or curriculum. So rather than use the terms culture and consciousness, I decided to start with a term already enshrined–academic. Academic skills, many of which have to do with communication, do after all help us orient ourselves with respect to culture. Using this term, I hoped, would bring pretty much all aboard. Then I could graft in a new notion–that education should also concern personal development. Hence the idea of planning courses and programs on two legs–Academic and Personal. There is a stealth aspect to this approach. I think most intelligent English teachers can agree that school should have strong, effective, research-based plans to help students grow as human beings, and not only plans for academic development. Such teachers, I think, could work with the two-legged idea, without necessarily announcing it to administrators or less-than-friendly colleagues. I hope these principles and practices that have been evolving out of my classroom and those of colleagues working with the Creed Project ultimately will become stepping stones in the direction Moffett pointed. Koshnick: Moffett was a proponent of eliminating false barriers between school and home life, between school and community, between school and spirit. As you put it in your book, “we should begin much more seriously allowing students to integrate their learning experiences among school, home and their community” (61). To me, this is what your book accomplishes so well. You describe tested, inventive ways to lessen what for most kids, now, certainly seems to them like a disconnect between school and life, life and school. With your Creed Project in particular, you prompt students to think–in a prolonged manner–about who they are and what they believe. You have said that your students’ culminating Creed presentations “are the most impressive and affecting classroom experiences I have witnessed in the 20 years since I became a teacher” (NWP, updated). As a teacher and a theorist in these matters, you have intentionally placed the focus of your curriculum on students’ creeds, on students’ beliefs. Can you give us some examples of the ways in which your deliberate focus on belief helps both you and your students eliminate, or overcome the disconnect, or the non-integration between school and life that is a familiar aspect of so many people’s experience within education? Creger: That’s another great question. Your phrase “overcome the disconnect” is picture perfect. I think the focus on belief or creed—I actually call it discovering values—overcomes the disconnect as you say first by going deeper than our present notion of learning can helpfully explain. What precisely does it mean to engage in deeper learning? Deeper in what respect? As reckoned by what criteria? Our present notion of learning offers no clear and useful way to think about depth in learning. So that’s one benefit of the approach I’ll talk more about in a minute. But the broad focus on discovering values also overcomes the disconnect by offering a way to complete a circuit that has been historically broken in school learning–the process of how we learn in real life. For these two reasons and others, we do not have a way to think about learning that works. This is a perfect time to introduce what I’m calling the Model of Workable 21st Century Learning. The model begins at the center, with a provisional central aim of learning. In more than 20 years of education courses, seminars, workshops and my own teaching, I’ve never been part of a conversation in which a central aim of learning itself was introduced, let alone discussed at any length. When it developed that I would be writing a book on the Creed Project I realized I could not write a book about learning without identifying at least a tentative main purpose for … well … learning! What you see in the central triangle of the model is only the most recent version: Deepening Understanding of World and Self and Increasing Mastery of Human Capacities. This is an improvement over the previous formulation, which used the term “personality,” a term with too many diverging connotations. At some point, I hope a group of colleagues can come to a broader consensus on how to word this model’s central aim. For now, I offer this provisional one. What may be the most useful aspect of the model is represented by the blue circular shape I call the Learning Continuum. My deeper studies, life experience, and long reflection tell me that I can perceive reality on three levels—the levels of fact, meaning, and value. In order to make sense of my experience I must ascertain the facts–of my own life, the lives of others, the world and universe: I am about to begin my 21st year as an English teacher at American High School in Fremont CA, USA, on planet Earth. I must interpret those facts, constructing or construing them into interpretations that explain the facts in various ways—their causes and effects, their chronologies, their parts and wholes, and other ways, logical, emotional, musical, intuitive, in which facts can be interpreted. This is the level of meaning: Teaching English is rewarding because an English teacher gets to interact with dynamic people, read intriguing literature, and help people develop skills to understand themselves, understand the world and universe, and how they fit into these big pictures. I also perceive reality, finally, on the level of values. Once I have ascertained a particular collection of facts and made an interpretation that follows from them, I can then decide how these facts or this meaning relates to what I stand for, or value, or what matters to me: My job matters to me because one of the things I stand for is helping young people create a safer, cleaner, more just world. An English teacher is uniquely positioned to make such an impact. I perceive my experience in life, then, as we all do in varying ways and to varying degrees, on three levels–the level of fact, the level of meaning, and the level of value. When I share this model with students, which I’ll do only briefly, in connection with a novel or essay we’re discussing, I’ll show this graphic on the screen. Then I’ll simply ask what the model seems to be saying. In the three years I’ve tried this, it’s never long before someone says the model is saying something about how we learn in school. “Excellent!” I’ll respond. “What point does it seem to be making?” If necessary, I’ll ask where most of what we do in school would fall in the model. Quickly, the class agrees that most of what they are asked to do in school is to master facts, the upper left hub (oval shape) in the Learning Continuum. In some classes, it develops, teachers guide them to make interpretations of those facts, the upper right hub, but not nearly as often as they’re asked to memorize and recall facts. Even more rarely, if ever, are they guided systematically to discover what they stand for, the lower hub of the Learning Continuum. A main premise of the Workable Model is that we are intended to learn in the same manner in which we perceive reality—through mastering facts, construing meanings, and discovering values. We are meant to learn all around the continuum. Most of what we teach and learn in school, however, stays on the surface, in the region of the continuum that runs between mastering facts and construing meaning. This region, or dimension, has to do mainly with operations of our minds—ascertaining and interpreting facts and forming opinions. The deeper parts of the continuum, centered around the Discovering Values hub, entail such issues as the formation of our identities, the education of our hearts, our relationships with others, discovering what most matters to us, which can include spiritual matters (undepicted). 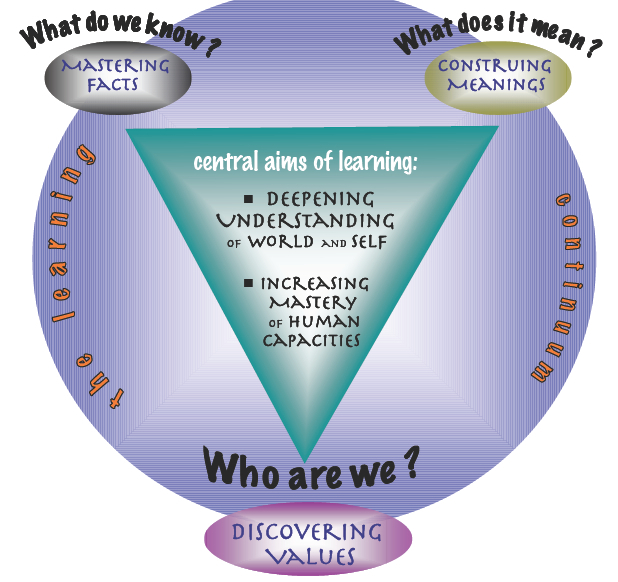 The region between the Construing Meanings and Discovering Values hubs, along the right side of the Learning Continuum, gets progressively deeper and personal as we move down. Somewhere toward the upper middle portion of this region we’d probably locate the cultivation of metacognition. Down toward the bottom, centered pretty much on the Discovering Values hub, we’d place the Personal Creed Project, since the project is completely about discovering our values. Somewhere in the region between Mastering Facts and Discovering Values, along the model’s left side, we might place service learning or volunteering in the community, since we choose to volunteer (or someone else chooses for us) because these factual activities are driven by values that affirm them. Educators will find much to discuss in exploring these two deeper “frontier” regions, or dimensions, of the Learning Continuum. Getting back to your question about how a focus on our creeds or belief (discovering values) helps us overcome the disintegration between school and our real lives. One answer is that focusing learning all around the continuum requires us to learn along the two deeper dimensions as well as the shallower one. Students are hungry for self-knowledge they rarely gain in school, or even beyond school. We gain self-knowledge in the two deeper “frontier” dimensions of the learning continuum. I had to begin my journey of self-discovery outside school. Thanks to this model, I think, we can finally understand the notion of depth and apply it in teaching and learning as we design courses and programs. Now we can “go deep” solidly, staying integrated with fact and intellect without getting lost in the mere touchy-feely or esoteric. Students are hungry for this, and in fact cannot live satisfying lives without it. I thought I didn’t have much to write about. After making the Creed Project write-ups, a bunch of new ideas flooded my head, and my imagination was once again let loose to run wild. . . . I feel that my writing has, since then, become a lot more fluid now that I am able to think more clearly, rapidly, and efficiently. The Creed project was more than a step towards my goal of portraying voice in writing; it was a flying leap that crashed me through the wall that has been blocking me from showing personality in my writing. Overall, this project helped me to start to figure myself out and, as weird as it sounds, helped me to discover what I’m really like. This self-revelation made me much more secure and comfortable with myself; this, in turn, helped me show more tone. I think that before this project, I struggled so much with voice because I had no self-assurance, and didn’t really think I had anything meaningful or important to say. But through the Creed, step III especially, I found out that I actually have values, beliefs, experiences, and flaws that all combine to make one unique individual with a distinctive voice. I would ascribe a significant portion of Lorato’s epiphany to the completion of a broken circuit in her acquisition of literacy—a reconnection between what she was learning and who she was becoming. Many of the “false barriers” you cite Moffett decrying arise from our limited understanding of the nature of learning. To the extent that this workable model turns out to be a fuller understanding of how we are “wired” to learn–and I have collected an enormous body of evidence such as the two pieces above that seem to support this premise–teachers finally have a solid rationale to integrate learning on multiple levels, in three dimensions actually. We’ve discussed the integration of facts, meanings, and values in students’ learning. The integration of the deeper values regions of the continuum, of their bodies, minds, hearts, and spirits, is clearly made real by helping students also integrate home, school, and community in their learning. Does this help answer your question? Koshnick: This might be a good time to set your work in context. We spoke earlier about where you think we are in relation to the vision of education Moffett lays out in Universal Schoolhouse. For those who haven’t read Schoolhouse, or who have wrestled with it, what would you say are the broad elements of Moffet’s vision, and how does your work fit in with it? 1) Personal development must be central, since all social problems can only be solved by enlightened citizens. 2) Far-flung community learning systems will replace schools as we know them, which focus too much on the needs of facilities and too little on the needs and natures of students. Schooling will become completely personalized, with few or no one-size-fits-all requirements. 3) Most social services will fall under the oversight of public education, since the wars on poverty or drugs can never be won as long as agencies depend for their survival on the continuance of the problems. 4) Education is decentralized to local communities, which receive only support from the various levels of government, with little or no oversight. 5) Control of public education will pass to private citizens, and from the control of politicians and business forces. 6) Spiritual development—the essence of personal evolution–will emerge as the prime goal of education. In the unfolding of his narrative, Moffett’s boldness and brilliance are in full evidence, along with much that makes simple good sense. Again, without the context Moffett provides, this list will not adequately represent his vision. My work, to place it in the context of Moffett’s vision, addresses the first and last of the points in the list above. Koshnick: How do you use this model as you plan your courses to make it real for your students–to help their learning run deeper and more connected to their whole lives? Skills, then, are a means to the end of our students’ personal unfolding, not an end in themselves. A key controversy in English education has always been how to conceive the place of literature in the curriculum. When I came into the profession, a literature-centered curriculum was regarded, in my district at least, as the cutting edge. While it certainly beats a skill-centered curriculum—in the high stakes sense anyway—a literature-centered curriculum seems to me built on the questionable notion that literature is the most fitting source of truth for everyone. This was questionable enough before the age of the internet. And yet few of us are ready to dismiss literature’s importance in helping our students discover themselves in their world and universe. Hence its position in the cross-section—second only to the main aim of students’ personal unfolding. The Cross-Section, then, provides the rationale for actively incorporating vibrant personal growth plans into existing courses and programs. How to actively incorporate such plans into what we now do in our classrooms? This is where Two-Legged Design comes in. I wanted the design of the courses to facilitate their central aim: to help my students discover who they are. Thanks to the Personal Creed Project, in my classes this has come to mean helping them come to understand what forces and people in the past have shaped them as they are today, what they stand for today, and how they want to live in the future. Literature and literacy skills, as I’ve come to see them, are means to this end. I couldn’t announce my real goal–to help students discover themselves–too loudly or widely in an era fixated on measurable results. Going back to my translation of Moffett’s culture and consciousness into academic and personal, I decided instead on a stealth approach. I would design my courses in two legs–one academic, the other personal. The obligatory academic skills orientation I house on the Academic leg. Beginning in the fall with entry writing and reading diagnostics, proceeding through the year with literacy skill development and literary and language study, we close out the year on the academic leg with a portfolio intended to assess students’ development in these academic areas. Why couldn’t the Personal leg have a similar Entry-Through-the-year-Exit design–with its goal being to help students develop a viable personal philosophy of living? I designed the Personal leg of the course to promote the development of my students’ wisdom. The study and acquirement of personal development, then, is the overarching theme of my sophomore English courses, both of which I title “Envisioning a Life.” We start the year with an Entry study of more traditional wisdom–the World Wisdom Project. We read, write, and talk about passages from the Bible, the Koran, Sufi stories and poems, Taoist anecdotes, Zen parables, Hindu tales, and short pieces of wisdom from whatever other traditions fit my students’ backgrounds, including the recent film Crash. This combined Academic and Personal project is my students’ Entry experience on the Personal leg of my courses. As you can see at the center of the figure, we use a number of tools to weave the ongoing study of wisdom through the year’s themes, literature, and various approaches to skill-development, allowing us to periodically reinforce students’ evolving personal wisdom. Koshnick: So what specific benefits does your approach bring to your teaching and, most importantly, to your students’ learning? Creger: This summer I was reflecting on all this, and thought of seven “idiosyncrasies” of the courses I teach. While they may raise administrative eyebrows in many schools today, they are fully justified by the model of workable learning and cross-section of 21st century Engish curriculum. I’ll simply spell out six of these idiosyncrasies here, without much explanation. My forthcoming article will explain how each feature takes shape in our classes, and what students say and write about them. ❖ First, my students get to spend a year in a class genuinely centered on their unfolding as human beings. Adding to the district’s official “English 10cp” and “English 10honors” designations, I actually include what I see as our real course title, “Envisioning a Life,” on most handouts. The courses are rigorously academic. But when students begin to understand that working to develop reading, writing, conversing, and thinking skills helping them find out interesting things about themselves, and that robust self-discovery can make an English class more fun and interesting, they appear more willing to learn and engage in class activities. Harnessed to a developmentally and curricularly appropriate exploration of students’ greatest interest—themselves–academics play a more effective role than they can as ends in themselves. Beyond standards, these approaches to English curriculum and course design are themselves aligned with a model of learning that may help the entire enterprise of education in our culture become more satisfying and successful for all involved. ❖ The Two-Legged approach to course design also facilitates a balance for my students between academic rigor and personal development. This past year, for example, students’ course evaluations indicated general pleasure with the personal development aspects of the course, but suggested a need for more attention to analysis and language skill development on the academic side. After taking a San Jose Area Writing Project summer seminar from Jeff House, I am preparing to introduce several new types of analysis for my students, along with what may be some improved approaches to grammar and writing improvements. The Two-Legged approach allows for such tacking to maintain balance. ❖ A second series of strands in the course I call Sustained Purposeful Reflection. This includes the longterm deep reflections of the Creed Project, short term in-class and at-home reflections on various topics, and reflections to prepare for class discussions like Socratic Dialogues. The intention is to keep reflection an ongoing force in students’ learning, their thinking, and their lives. Many comments in my June harvest justify the inclusion of this strand in the course. ❖ The course foundations in the workable model and the cross-section also lend themselves nicely to the ongoing emphasis on the study of wisdom. Beginning in the fall with the World Wisdom Project, students trace many of its concepts and terms through our literature and discussions through the year. The generalized study of wisdom comes home in the spring with the personal wisdom in the Creed presentations. This is another benefit to students—each is supported and guided to discover what he or she most values in life, and what kind of life he or she would like to live based on those values. ❖ Finally, the personal foundations of the course have provided ample justification for the practice of meditation, which claims seven to ten minutes of our time per week. Increasingly popular, valued first in many students’ minds as a prime timewasting opportunity, but slowly becoming an activity valued for the personal benefits it accords, our classroom “mindchilling” gives students regular practice in calming, detaching and focusing the mind, and nourishing the heart. I like to think James Moffett would have approved. Koshnick: Is there anything else you’d like to add? Creger: Just that I invite anyone who has questions, comments, or related work to share to check us out on English Companion Ning. Students for a number of years have been telling me “the Creed” should “go national.” In the last couple of years I’ve seen pleas for it to go “global.” The ECN group has made both a reality. Great group of interesting folks from across the U.S., Canada and around the world. Thanks, Damian, for having me on and for the great work you’re doing here on the JMC. Koshnick: Again, thank you for joining us. A Composing Blog at WordPress.com.